Removing the toothpaste is a procedure that removes a stone from the surface of the tooth resulting from poor maintenance of oral hygiene or because of the composition of saliva that is lit in the mouth. Usually the stone is created on the front lower and lateral teeth and thus blocks the interdental spaces of the tooth exchange and the bacteria that are located on its surface adversely affect the bone and tooth of the tooth. After a long period of time, the bone is broken down and the tooth gingiva withdrawn. Soft deposits (dental plaque) are formed on the surface of the teeth during the night especially in the neck of the teeth. If the hygiene of the oral cavity is not maintained, a dental stone is formed on it that can not be removed by a toothbrush after forming, but you must contact a dentist. You can effectively perform a dental calculus treatment in our dental office using an ultrasound method. The removal process ends in one treatment and lasts from 30 to 40 minutes. Regular use of halcyon products such as thread and cleansers reduces the possibility of its formation, with dental control up to twice a year. Dental fissures are used most often in children but also in adults with pronounced lumps and fissures on the bite surfaces of teeth molars and premolars. Anatomical shape of the tooth, fisura is suitable for collecting and retaining food and therefore a convenient place to create caries. 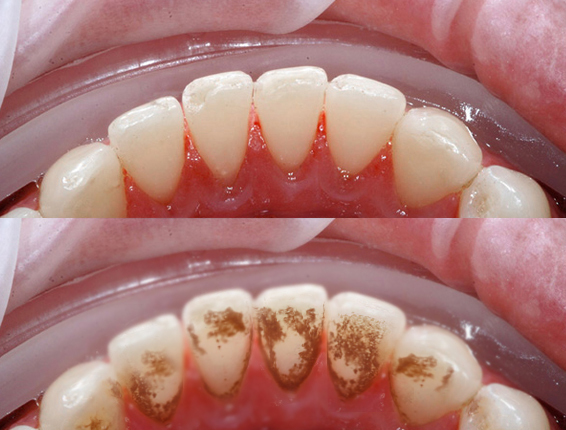 Due to the inaccessibility of the brush and the possibility of adequate cleaning, there is food retention and caries formation. In order to avoid retention of food and to clean these inaccessible surfaces with special material in the dental office, filling up of submerged sites that are suitable for caries creation is done. This method is called watering fissures. After treatment of fissures, maintenance of oral hygiene and regular visits to the dentist, the risk of caries formation is reduced considerably, up to 70%.